Dental implant restorations are done in two stages: the first stage involves placement of a replacement tooth root by your dentist and the second stage involves placement of a tooth replacement (crown) at our office. Dental implant placement procedures differ in duration and in the materials used. However, all implant procedures begin with a detailed consultation and case planning with your dental team. As experts in creating dental implant restorations we will make sure your dental implants look and feel like your natural teeth. Because there is a requirement to allow time for healing between the procedure of dental implants, the duration of it becomes highly variable. In cases where the patient is healthy with healthy jawbone tissue, specialists can also execute the whole procedure within one day. This is done by placing the implant and crown together. This procedure can be called as “immediate loading”. However, it is normal for the crown to be fixed after several months of placing the implant. This is required so that the implant fuses properly with the jawbone. Where bone grafting is involved, it can take several months for the graft to heal before the time comes for placing the implant. Again time of several months is given to the implant to integrate into the bone before fixing in the crown. The very first step is taken by your specialist dentist where the area is exposed by folding of the gum. The bone which gets revealed is then prepared to receive the implant. The number of implants effect the extent of work required for preparing the bone. The gum is sutured back after placement of the implant(s). A period of 3 to 6 months is given to the implant to get fully integrated into the bone. A custom prepared crown is then fitted for the post. 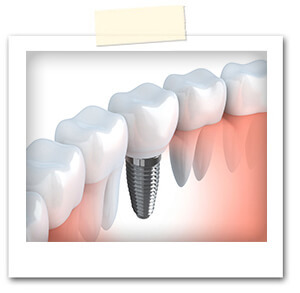 More or less the same procedure is followed with minor changes based on the structure of the implant used.